Author Interview: Dr. J. R. Paine, D.Sc. & Dr. S. N. Gupta, Ph.D.
by Dr. J. R. Paine, D.Sc. & Dr. S. N. Gupta, Ph.D.
Dear God, Let Me Lose Fat, Amen holds every dieter’s hand and walks them through their inner body, introduces them to their stomach, cells, tissue, heart and other vital organs. The E-School provides 24/7 personal trainer 24/7 pinups. All dieters and non-dieters can avail themselves of instant help when they get the urge to splurge. The vast community of dieters should seek the advice and consent of their own personal physician for their special and specific health needs before they decide to diet or not to diet. Prior to retirement, one of the authors’ “real” job was Distinguished Professor of Physics in Michigan and the other a free-lance journalist and political leader. We have always believed that the pen is mightier than the sword. Yes, writing is one of the joys of our lives. 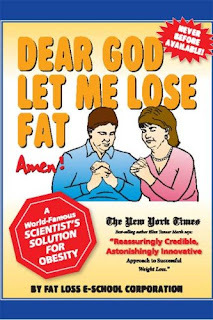 One of our books is titled “Dear God, Let Me Lose Fat, Amen”. It looks like a book but works like a 4-year college course so artfully condensed and simplified that everyone between the ages of 16 to 106 can not only understand each and every word but become an expert in how the internal mechanics of the human machine and brain. We knew from our extensive research that the human brain forms a million new connections for every second of our lives. It is in these changing connections that memories are stored, habits learned and personalities shaped. By reinforcing certain patterns of brain activity like desire for survival, health, vigor and vitality, and losing the craving for nutrient-poor, killer calorie-rich, high-fat, high-sugar and high-salt fatty FAST DELIVERY, FAST FOODS and fluids with FAST DELIVERY, FAST FACT knowledge nutrition for the brain, the obesity nightmare could be ended. The hands of the death clock that took the life of one American every 2 minutes could be slowed and finally stopped. The billion dollar question for usto answer was “How did we get into such a severe health and obesity crisis and how do we get out of it?” The answer is: (a) For 5 decades, we have had 100% easy access to FAST FOODS and (b) ZERO, ZIP access to FAST KNOWLEDGE! To remedy this situation, we Innovated a 21st Century Zero Obesity System in our book “Dear God, Let Me Lose Fat, Amen”. Our 2nd book, soon to be available on www.amazon.com is titled “Health Super Spa In a Book”. It in, we zoom our Zero Obesity System to the highest point in self-serve universal health care, indeed into the stratosphere! Yes, indeed. We are creating an AUTO-SLIM HOME HEALTH HUB such that Families all over America and all around the world can avail themselves of 24/7/365 Virtual Health and Zero Obesity Info-Therapists, Nutritional Bodygurads, Tutors, Personal Trainers and much more. Yes, the co-authors are married to each other! They work as a husband/wife team. We have a son and a daughter. Our Son, Paul R. Gupta, Esq., a Harvard Law School graduate, as a senior partner in a New York Law Firm. Our Daughter, Dr. R. K. Brylinski, a Ph.D. from M.I.T. is the CEO of her own company, Brylinski Science. We grew up in India, Ireland and Great Britain. We currently live in Bloomfield Hills, Michigan, a suburb in Oakland County. If we could live anywhere, we would like to live for a few years on the planet Venus! If we could, we would want everyone to understand that when we lose our health, we lose the universe. We try hard to coax and entice everyone into making good health and zero obesity a habit, a hobby and definitely not a hassle. “Dear God, Let Me Lose Fat, Amen” is available at www.amazon.com. Great interview! I agree, there is an obesity pandemic in America and something like this simple book might just make a difference. Thanks for sharing.